You will be surprised to learn that in 1870, Rev J F Hodgson described our lovely church as “a fair average specimen of the rude old Durham churches of the third class”. In fairness to Mr Hodgson, this was before the restoration of the church in 1881-82 during which, the plaster was removed from the walls and the beauty and antiquity of the church revealed. After the restoration Mr Hodgson said “the silence of a thousand years was broken”. 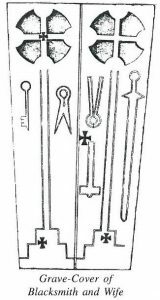 Instead of what appeared to be entirely a late 12th and early 13th century building, the very extensive remains of a much older and Saxon structure were found to be still in situ and forming part and parcel of the actual fabric. You can see part of the walls of the Saxon nave above the arches of the later aisles. If you look carefully you can detect, roughly opposite the main door, a straight vertical join on the north wall of the nave, marking the end of the nave of the original Saxon church. Looking at what was the exterior face of the Saxon nave, you can see two large corner stones (one flat and the other tall and narrow) of a type often used in Saxon churches. In fact, there has been a church here for over 1200 years. The Anglo Saxon Chronicle states “782: In this year Werburh, Coelred’s Queen and Cynewulf, Bishop of Lindisfarne died. And there was a synod at Aclea” A second synod was held in 789. Aclea, the old name of Aycliffe, means “clearing in the oaks”. The village is still called “Yackley” by some. 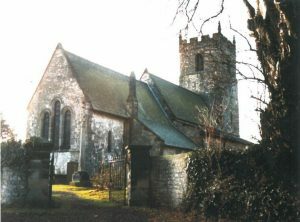 The church was originally dedicated to St Acca, who was chaplain to St Wilfred and a close friend of the Venerable Bede, and who became Bishop of Hexham in 709. Some time after his death in 740, a church dedicated to St Acca was built here and the dedication was transferred to the present church when it was built in the tenth century. 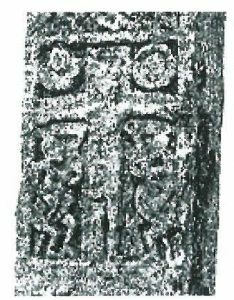 The presence of the two pre-Conquest crosses (now at the west end) and other sculptured stones dating from the 9th to 11th centuries is further evidence of the importance of Aycliffe in those early times. There are also some later medieval stones. Details of the crucifixion of St Peter scene. The cross in the south west corner features a centaur-like creature, which has a horse’s body, head and legs, but human arms. Both crosses contain much decoration with interlacing patterns and intertwining beasts. Viking influence can be seen in some of this work. The north aisle was added c1170 by piercing through the Old Saxon walls and extending the nave by 12 feet westwards. 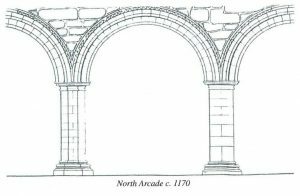 The arches have the familiar Norman chevron design and the pillars alternatively round and octagonal. 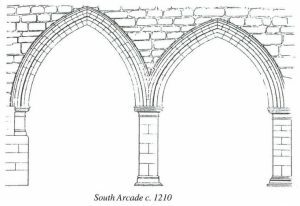 The south aisle was added also by piercing through the Saxon nave wall, which resulted in the irregular shape of the arches. A chantry chapel was established here from the beginning. The trefoil-headed piscina, used for the ablutions at Mass, is in the south wall. 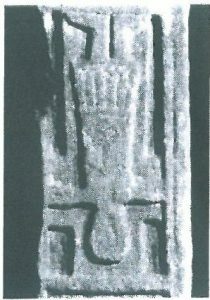 The Grave-Cover of the priest, probably John De Akeley, Rector of Great Stanton and Archdeacon 1311 – 16 (a member of the local Amendeville family) is found in the North West corner of the church, close to the effigy of a knight dressed in chain mail. The knight was probably Sir Thomas de Amundeville de Whitton, Seneschal to Bishop Stickell and Lord of Woodham and Whitworth who died about 1305. The Grave-Cover of the blacksmith and his wife, also early 14th century, lies in the south west corner of the chancel. It was brutally trimmed away to make it fit on its present position during the restoration. Two of the Saxon stones found during the 1881-82 restoration were built into the south wall of the chancel, as were three later fragments of tomb covers. The fine Jacobean pews in the nave and the pulpit are of oak, dating from about 1630 and were modified considerably in 1881. 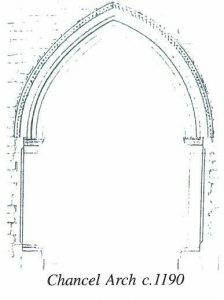 The chancel arch was originally very narrow, little wider than a doorway. It was enlarged about 20 years after the chancel itself was rebuilt and enlarged. The arch has undergone considerable distortion, as it was well supported on the north side but not on the south at the time of construction. The tower was added to the church about 1210, at the same time as the south aisle, and the north aisle was extended to its present length. The tower was crowned by a wooden spire. By the beginning of the 15th century, this spire had disappeared (a fire?) and a fourth storey was built to receive the bells. The original deep and heavy battlement on top of the tower was replaced in 1881 by one of squared stone, very much lower and lighter. Henry VIII’s Commissioners found “two bells in the steeple”. These were later removed when Aycliffe was occupied by Cromwell’s troop. Two of the bells now in the tower were made in 1664 and the third in 1869. The front is very primitive and undecorated, square above and circular below. It is no later than 12th century and could be much earlier. On either side, there are slots which formerly held a cover. The present porch was erected in 1835. The inner doorway is original 13th century. It has two stone heads, a “young man with flowing hair bound about his head by a chaplet of roses” and a woman “of mature life, in cap and wimple”. The nave and aisle roof were replaced by a very low roof in the 15th century. The nave roof was flat. The chancel roof of the 3early 19th century was described as “a miserable structure of varnished deal and plaster”. In the wall above the entrance to the tower, you can see the doorway which gave access to the tie-beam roof in the 13th century. In 1881 the nave and chancel roof were beautifully restored to their former dimensions and the aisle roof renewed. At this time the organ chamber and vestry were added.